I have been involved in fitness for the greater part of my life. I played high school football and then went into the Marine Corps for 5 years. I first heard about CrossFit in 2007 when I was still in the Marine Corps. I was astonished by the results from the program and have been extremely passionate about CrossFit from that day forward. In August 2008 I became a CrossFit coach and have been focused on training and helping athletes improve their skills and abilities. I have coached a team and two individuals (Terry Ferrari in 10th place and Rick Rodriguez in 2nd place) to the Crossfit Games in 2009, 2011 and 2012. I have had a passion for fitness and nutrition in some manner for as long as I can remember! I grew up wrestling in middle school and high school, which lead to me becoming even more fascinated with health and human performance. After high school, I dedicated my efforts to becoming as strong as I could possibly become. However, in doing so, I realized I was severely lacking in other areas of my fitness. I received my BS in Kinesiology with an emphasis in exercise science, and shortly thereafter is when I discovered CrossFit! After my first CrossFit workout, I realized that this was everything I was looking for in a training program and truly haven’t looked back! It is the constant physical and mental challenges, and the fortitude that is required to achieve them, that is what I love most about CrossFit. I am the mother of 3, Grandmother of 5 and wife to my Husband for over 30 years! My introduction to CrossFit was about 5 years ago while training at a more traditional style gym. I was asked to do a hand-stand against a wall, which I refused to do and firmly reminded the trainer about how old I was. Shortly after that encounter I joined up with my Son and a very small group of others and started training “CrossFit” in a little garage. We called ourselves CrossFit La Verne! We grew, I learned how to do handstands (along with a few other fundamental movements), ended up with my Level 1 Cert., and discovered just what I was probably designed to do, teach and train CrossFit! I hope that I can be an example to those “Masters” that question our program and wonder if they can do it. And, to the “regular” people…I hope that I never become less of a challenge. I grew up playing volleyball, amongst other sports since I was a little girl. Team concepts and non-stop working out/training was my passion. After graduating from CSUN, I coached volleyball for a short time and quickly became interested in lifting weights. During my trial and errors, I met a powerlifting coach and never looked back. I became involved in powerlifting competitions and half marathons and so on. My passion for fitness grew in so many directions. After attending CFLV for the first “STRINGER” WOD, I was hooked on Crossfit! I am growing as an athlete and as a coach every day! 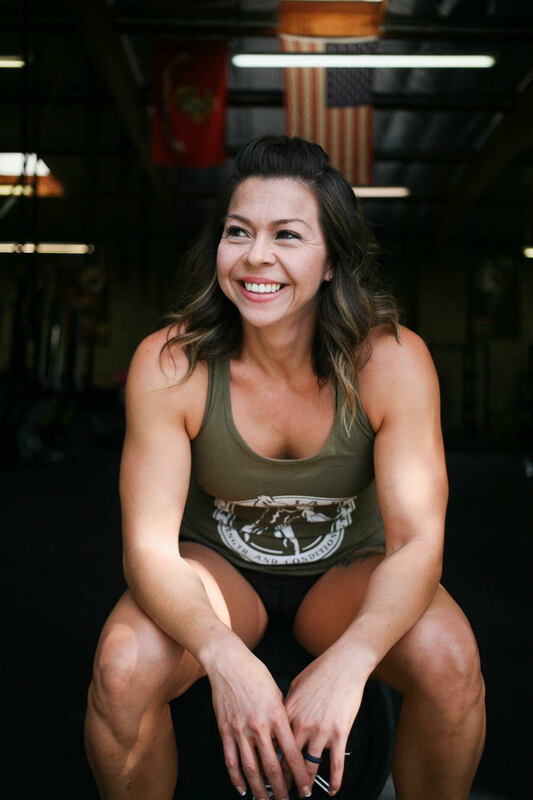 I am a CrossFit Level 1 Trainer, strength and conditioning coach, Muay Thai instructor and I have been an athlete all of my life. I grew up participating in hockey, basketball and martial arts. I heard about CrossFit through a friend in 2009 but did not start CrossFitting until 2011 after I saw the 2011 CrossFit Games replay on ESPN. I was instantly floored by the work capacity of the athletes. A few months later, in October 2011, I started a 6 week CrossFit boot camp class at Crossfit iDog in Huntington Beach, CA - thanks to my friend, Josel, who posted a flyer on Facebook. My experience extends beyond the realm of CrossFit into the world of martial arts where I have been training in the art of Muay Thai since 2006. In 2009, I started coaching circuit training classes at the Muay Thai academy I was training at, Dobler’s Muay Thai. It was there that I learned I wanted to be a coach simply because of the progress I saw in the athletes that I was training and when one athlete was asked to describe me as a coach in one word, psycho. In 2012, after a year of CrossFit and 6 years of Muay Thai, I was sought after to coach strength and conditioning at Heart & Pride Muay Thai in Ontario,CA. This is where I had the pleasure of coaching everyone, from beginners in the art to beginners in the ring. After training at three different CrossFit gyms, I began training at CrossFit La Verne in December 2013 - fell in love with the community and the brutal workouts. In July of 2014, I became a CrossFit Level 1 Trainer and in October 2014 started coaching at CrossFit La Verne. I love the CrossFit community and hope to continue coaching until I can no longer lift a barbell… which is most likely never so you’re stuck with this psycho :D.
I served in the Army/Army Reserve for 12 years and thought I was in the best shape of my life. Along came CrossFit (thanks to my husband) only 30 days after having a baby and it changed me. Physically and mentally. At 38, I am in the best shape of my life. Encouraging and motivating people to do things outside of their comfort zone is what I find the most gratifying. CrossFit brings a sense of camaraderie that reminds me very much of the military. I have been coaching CF since 2013. I’ve also participated in a number of CF competitions to include the CrossFit Games in 2009. Besides CF, my other hobbies include Ragnar races, snowboarding, bike riding, trail running, and any other sports that challenge my physical abilities. One of the most important things as a trainer is helping someone learn proper techniques and how to incorporate these movements into daily life. I believe that functional movements will help people remain successful in the future, no matter your age, disability or fitness level. CrossFit is for everyone, no matter what your goals are.